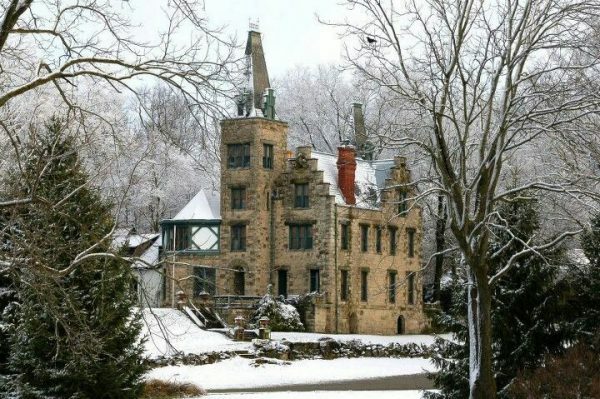 12 Ohio Castles You Need to Visit This Winter - Ohio. Find It Here. You don’t have to go to Europe to see some great castles. In fact, there are some amazing castles located right here in Ohio. All across the state, these landmarks range from being truly historical, century-old structures, to more modern, historically-inspired buildings. Here are a few you should visit to get rid of those winter blues. Located near Ohio favorite, Hocking Hills, Ravenwood Castle is modern structure designed to resemble 12th and 13th century castles on the border between England and Wales. Ravenwood was completed in 1995 and designed as a medieval-themed hotel. As a hotel, the rooms are decorated in the same medieval style with fireplaces, fake stone walls, and antique furniture. It’s not completely medieval, however, as there are some modern features like whirlpool tubs and kitchenettes. The main structure consists of seven luxury rooms, with cabins, cottages, and “gypsy wagons” nearby on the premises. Original owner and builder, Melvin C. Clarke, was a prominent abolitionist and local attorney. He originally built the castle a home for his family in 1855 complete with a tower, spires, and other Gothic Revival elements. It was later given to the City of Marietta to be used as a public space for concerts, events and celebrations. Marietta castle is marked on the National Register of Historic Places. Located near Mohican State Park, Landoll’s Mohican Castle is a truly magnificent hotel designed to look like an Old World castle. The building opened in 2002 and has eleven unique suites, with an additional suites in nearby cottages. The castle’s suites have European-style decor, whirlpool tubs, microwaves, gas fireplaces, fridges, and cable TV. Some suites have even garden access, four-poster beds, and private balconies. The hotel also features an indoor pool and restaurant. For activities, guests can enjoy carriage rides through the forest, ghost tours, and murder mystery dinners. Built as a home in 1895, original owner Samuel Ruggles designed it after the many European castles he visited in his travels. 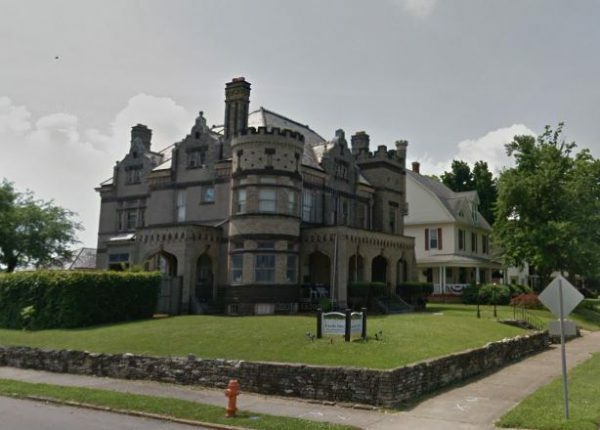 Lovingly decorated with beautiful stained-glass windows, rose marble walls and intricate walnut furniture, the castle now serves as a BnB in Circleville, Ohio. Though they kept the original vintage details, the rooms have been outfitted with fireplaces, jacuzzies, private dining rooms and sitting areas. Hot breakfast is served each morning and the inn hosts their famous Murder Mystery nights for costumed guests! Château Laroche or the Loveland Castle is located on the Little Miami River near Loveland. Its construction began in 1929 by Harry D. Andrews, a Boy Scout troop leader, a medievalist, and World War I veteran. Designed to resemble historical European castles, Andrews worked on the castle for more than 50 years, even bringing in stones from the Little Miami River. In his will, Andrews gave the castle to his Boy Scout troop known as the Knights of the Golden Trail. The troop members have continued to upgrade and renovate it and eventually opened it to the public as a museum. Legend says that, driven mad by a broken heart, German Immigrant, William Schwartz built his castle with secret passageways and five stories of basement. Visitors to German Village claim they can still see the ghost in the tall turret windows visible from the miles across Columbus. Now the building serves as an apartment building and historical landmark – easy to enjoy on an afternoon stroll after popping into one of the many cute coffee shops in German Village. 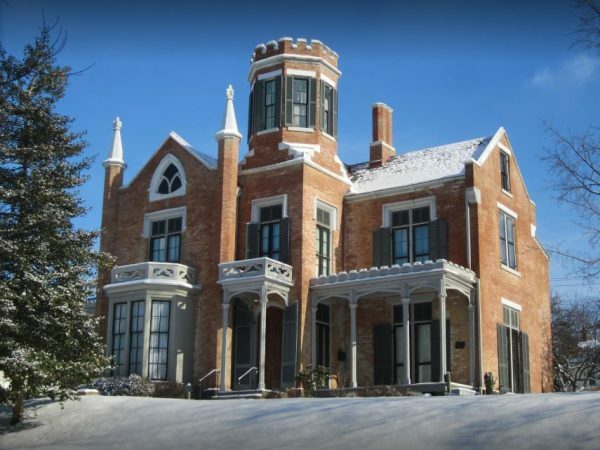 Located in Logan County are two brilliant Gothic castles built in the 1860s and 1870s by the Piatt brothers, who lived in the area. The castles, named Mac-A-Cheek and Mac-O-Chee, are now a private museum open to the public. Each castle has three stories, towers, painted ceilings, and intricate woodwork. The Piatt family actually still owns and manages the castles, opening them for tours in 1912. Today, they are popular sites for concerts, weddings, receptions, camps, and historical reenactments. European immigrant from Wales, William Henry Morgan was of course inspired to build his castle in 1904 after the authentic designs of European castles he was familiar with. Sitting on 50 acres, the castle now serves as the administrative building for the Alliance City School district – but the building is still home to the original billiard room, bowling alley, and indoor swimming pool! Stan Hywet Hall is the name of the former estate of F.A. Seiberling and his family. Seiberling co-founded The Goodyear Tire & Rubber Company. The estate was constructed between 1912 and 1915, and the Seiberling family lived here until the 1950s. After that the hall was donated to a non-profit organization so that future generations could enjoy the majesty of this expansive home and the well-maintained gardens that surround it. Stan Hywet is Akron’s first and largest National Historic Landmark. It is among the Top 10 largest historic homes in the nation open to the public! Located in Willoughby Hills near North Chagrin Reservation, this castle was completed by Feargus B. Squire, who worked for the Standard Oil Company, in the 1890s as the future gatekeeper’s house. He was planning to build a large country estate on the land but unfortunately never fulfilled his dream. Squire eventually sold the castle and the surrounding 525 acres to the Cleveland Metroparks in 1922. Today Squire’s Castle is open to the public. The Willoughby Hills Public Library even holds a history seminar in the castle every year and the legend about the ghost of Squire’s wife attracts many curious visitors from across the land. 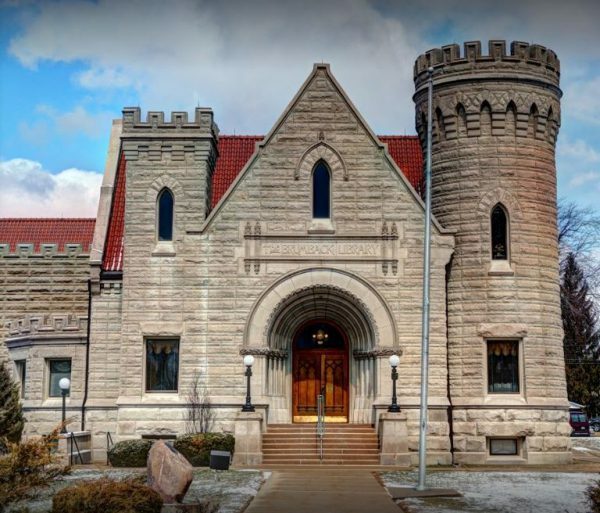 Named after its founder, John Brumback built this castle-style library as an effort to assist 12 women in Van Wert, Ohio establish a library foundation for local residents. The 1,400-book library became a free city resources in 1896 after Brumback offered to finance it, believing everyone deserved free access to books. The castle is surrounded public grounds and a park that serves as a vital part of the Van Wert social and cultural life. Over 100 years old, this picturesque BnB is located steps from Sidney Courthouse and the Square Historic District. The castle boasts a large wrap-around porch perfect afternoon tea, and two acres of manicured lawns and gardens. Guests can enjoy ornate fireplaces, and free Wi-Fi while they explore this lordly manor!